In addition to being a music teacher, composer, and video game enthusiast, I am also a percussionist! I played all kinds of mallet percussion instruments in my high school’s marching band in the “pit” section (front ensemble). In today’s article, we are going to be talking about a small family of keyboard mallet percussion instruments that all have characteristics in common, but each contribute very different things, musically. I thought this would be a fun lesson to tie in with “Secret Whispers”, because the track uses two of the four family members. 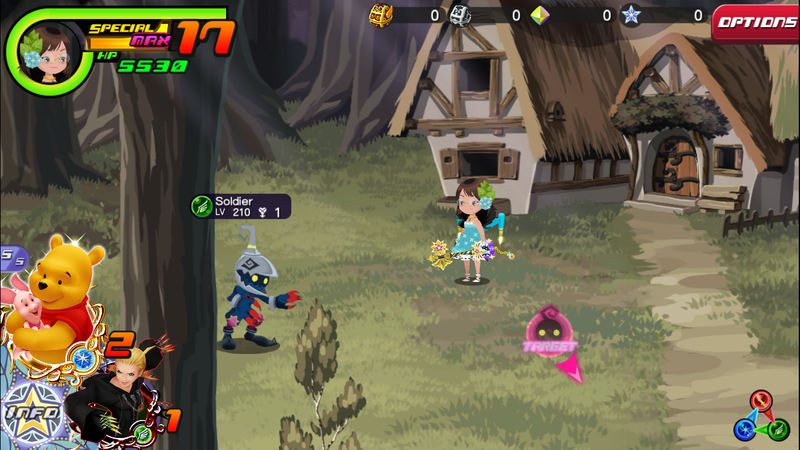 “Secret Whispers” first showed up in Kingdom Hearts: Birth by Sleep, and in Kingdom Hearts Union Cross it is the field theme for the Dwarf Woodlands. This track is a lot of fun! The first time I heard it was in KHUx (I haven’t played Birth by Sleep yet), and I was instantly captivated. From the bouncy bass line to intriguing, haunting melodies, “Secret Whispers” has a lot to offer in terms of variety and form, in addition to using two of my favorite percussion instruments. Let’s talk about the keyboard mallet percussion family: “keyboard” meaning notes identical to that of a piano, and “mallet percussion” meaning struck with mallets (wooden sticks with different kinds of ends, sometimes made of yarn, sometimes plastic). Now the first instrument in the keyboard mallet percussion family is the one that everyone knows, and the one that everyone assumes the others are also: the xylophone. The xylophone is a small, wooden keyboard mallet percussion instrument. Click here to listen to a xylophone solo piece. The xylophone actually does not make an appearance in “Secret Whispers”. Instead, the wooden keyboard mallet percussion instrument that you are hearing—mostly playing bass notes and some upper register trills and doubling the melody in one section—is the marimba, which is big and wooden. Click here to listen to a marimba solo piece. One of the most important differences between the xylophone and the marimba is not only the difference in size, but also in resonance. The large tubes beneath the marimba is what makes each note really resonate and linger in the air a bit longer before fading. Contributing high-pitched metallic sounds during the middle section of “Secret Whispers” (00:41 – 00:48) and some more accents after is the glockenspiel, which is small and metal. Click here to listen to a solo glockenspiel piece. The last of the four, like the xylophone, does not actually make an appearance in “Secret Whispers”, but I will add it in to complete the table—not to mention it’s also my favorite of the four :3 The big, metal keyboard mallet percussion instrument is none other than the vibraphone. Click here to listen to a vibraphone solo piece. Although seemingly very similar, each member of the keyboard mallet percussion family offers something very different and unique. The xylophone is good for bright and punchy melodies and runs; the glockenspiel is fabulous for sparse, icy accents; the marimba is excellent for warm, low-pitched tremolos and even melodies in the upper register; and the vibraphone is wonderful for sustaining long pitches (notice the pedal), among other things of course.